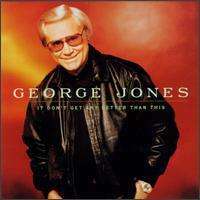 It Don't Get Any Better Than This is an album by American country music singer George Jones released on April 7, 1998 on the MCA Nashville label. Jones's 55th studio album would be his last with MCA Nashville Records. The album's title track was used as the theme song to Jones's talk show which aired on what was then The Nashville Network. The program featured informal chats with Jones holding court with country's biggest stars old and new and, of course, music. Guests included Loretta Lynn, Trace Adkins, Johnny Paycheck, Lorrie Morgan, Merle Haggard, Billy Ray Cyrus, Tim McGraw, Faith Hill, Charley Pride, Bobby Bare, Patty Loveless and Waylon Jennings, among others. Singles released from the album were "Wild Irish Rose" and "No Future for Me in Our Past", both of which failed to chart, a common occurrence for Jones in recent years since he was no longer played on mainstream country radio. The song "It Doesn't Get Any Better Than This" includes several guest vocalists, including Johnny Cash, Waylon Jennings, Willie Nelson, Bobby Bare, and Merle Haggard, while T. Graham Brown duets with Jones on the song "Got To Get To Louisiana". Many of the songs on the album have a chequered history. "When Did You Stop Loving Me" was originally recorded by George Strait on the soundtrack to the 1992 film Pure Country, and was a Top Ten single for him in 1993. "Small Y'all" was previously recorded by Randy Travis on his 1994 album This Is Me, and later re-recorded by Jones as a duet with Kenny Chesney on Chesney's 2010 album Hemingway's Whiskey. "Smack Dab" was later recorded by Ken Mellons on his 2004 album Sweet, and "Don't Touch Me" is a cover of the Jeannie Seely single. The album also features several songs written by Nashville veteran Bobby Braddock, who co-wrote "He Stopped Loving Her Today". AllMusic states of the album: "It's not a bad record by any means, and George is in surprisingly good voice, hardly sounding like a man approaching his 70th birthday. Still, there's no truly great performances or unusual songs to make it worth putting on after the initial play." David Cantwell of Amazon.com singles out "When Did You Stop Loving Me" for special praise, as well as "the elegant evocation of unrequited love" found in 'Don't Touch Me.'" Strings performed by the Nashville String Machine, conducted by Carl Gorodetzky and arranged by Bergen White. ↑ It Don't Get Any Better Than This (CD booklet). George Jones. MCA Nashville. 1998. MCAD-70005.